We’ve all been there. Someone you know has purchased a shiny new television, and they’re happily showing it off to you in all its high-resolution glory. But once you start up a movie, something looks a little bit...off? Somehow? It’s as though the extra clarity of the new television is somehow making the film look worse. Film sets look like… well… sets, and CGI no longer blends into the real environment like it should. Some people seem to think this is just an inevitable consequence of buying a fancy new TV, but this couldn’t be further from the truth. In fact, what you’re witnessing is more commonly referred to as motion smoothing, or the ‘soap opera effect’, and is caused by your TV aggressively processing its video in a way that actively makes content look worse. Since this original shot was fired, a host of other directors have since pledged their support for the cause. So what is motion smoothing, why do directors hate it, and why do television manufacturers insist on including it in their sets? Put simply, the ‘soap opera effect’ is the unintended consequence of your television’s motion-smoothing technology. Although most televisions these days feature a panel that refreshes 60 times over the course of a second, most content is still filmed at 24 frames per second. In order to smooth out this motion, most televisions now include some form of motion smoothing technology (although almost every manufacturer seems to have a different name for it). This technology will artificially insert more frames into a video in order to reduce motion blur, and make movement in general appear smoother. This works great for sports where it can be a struggle to keep track of a fast-moving ball, but it’s not as good for films, where the extra frames make everything look fake and unnatural. The problem with motion-smoothing comes down to the fact that, fundamentally, your TV is trying to add extra information to an image that simply isn’t there. Think of it like ‘colorizing’ black and white photographs. Here, you’re trying to guess what colors should have been in the original image, and as such it’s never going to look quite as good as an image that was originally shot in color. A TV is doing the same thing, but with motion instead of color. What makes this effect worse is the fact that a television is trying to do all this work in real time as it receives and transmits the data. It can’t afford to spend the time getting a frame looking perfect because it has to generate around thirty of them every second. And yet, despite all the issues with motion-smoothing, it’s still pretty essential for all modern televisions. Bear with me. Part of this has to do with the fact that, as outlined above, motion-smoothing looks pretty damn good when it comes to sports, but it also has benefits for cinematic content like James Gunn and his ilk produce. The world of cinema has clung pretty tightly to the 24 frames per second standard over the years, and for the most part, the world of TV and online video has done likewise (the exception being the PAL territories of the world who prefer 25fps for… uh… reasons). Now, I don’t have an issue with 24fps as a standard, but it creates a lot of problems for 60Hz televisions. In an ideal world, TVs would be able to refresh at 24Hz, so they could neatly refresh once for every frame. However, with a refresh rate of 60Hz, TVs need to work out a way of dividing 24 frames into 60 refreshes, and this leads to problems. The standard way of dealing with this is to show the first frame twice, the second same thrice, the third frame twice, the fourth frame thrice, and so on. By the time the panel has refreshed 60 times, all 24 frames will have been shown. But this 2:3 ratio isn’t ideal, and creates a certain amount of judder that’s especially noticeable during panning shots. In an ideal world we’d all have 120Hz televisions that can neatly show 24 frames per second, but while we’re still predominantly relying on 60Hz screens a certain amount of motion-smoothing is going to be needed. Too much motion-smoothing creates the soap opera effect, but two little leaves your content juddering as your TV struggles to fit a square peg into a circular hole. To avoid the worst of both worlds we’d suggest leaving motion-smoothing on, but turning it to its absolute minimum setting. That said, there are certain occasions when you should absolutely turn off motion smoothing entirely. Chief amongst these is gaming in all its forms. The additional processing power creates input lag, which will make games feel sluggish and unresponsive. Trust us on this, just leave it off. Thankfully, some TVs allow you to change settings on an input-by-input basis. If you TV allows it, then we’d suggest turning off motion-smoothing completely on the HDMI input that your games console is plugged into. Then again, if you use your games console for any kind of media playback then this solution isn’t going to help you much. The soap opera effect is especially unkind to gaming experiences. Will we ever not need motion smoothing? It’s clear that the state of television technology at the moment will make motion-smoothing pretty essential for the immediate future. There’s just no foolproof way of playing back 24fps content on a 60Hz screen without introducing judder. In the longer term 120Hz panels could at least partially solve the problem, but even these will create issues with PAL’s 25fps content. In fact, to solve these problems for both 24 and 25fps content you’d need at least a 600Hz screen, which isn’t going to be possible anytime soon. So, for the time being at least, it seems motion smoothing is going to be a necessary evil. The realities of refresh rates mean that it’s not going anywhere anytime soon, and any attempt to kill it off is a bad thing for film-fans everywhere. 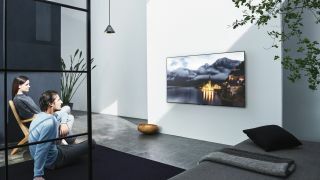 For our top TV picks, check out our guide to the best 4K TVs or, if you're looking for a TV bargain, check our full guide to Black Friday.